Ref.3504 : French property for sale in Pays de la Loire. 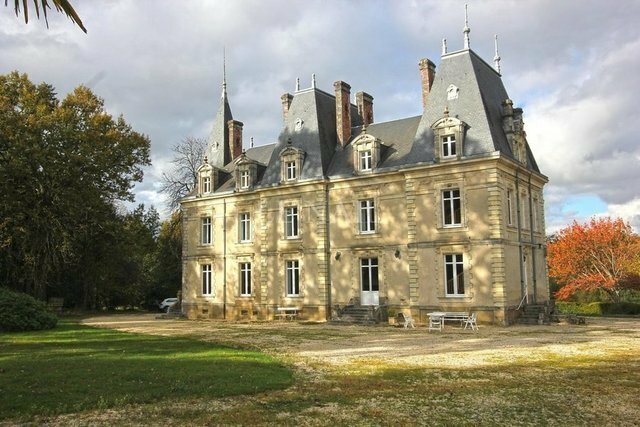 Located between Rennes and Nantes, this elegant chateau enjoys the immediate proximity of a small town offering all services and shops. It is accessible by a beautiful tree-lined driveway. This chateau was built in the early nineteenth century in the middle of a park pleasantly planted with a wide variety of trees. -On the ground floor: an entrance, a large living room, another living room, an office, dining room, kitchen, wc. -Upstairs: 7 bedrooms, 2 bathrooms, 2 shower room, wc. -Above: 5 bedrooms, a shower room with toilet and 2 attics. -Basement: cellars and shed under the entire house. The living area is about 160 sqm per level. Stables, garages with attic above. Two small rented pavilions, one 460 EUR per month and the other 490 EUR per month. In the park, a small sheepfold. A beautiful English park of 19 acres (7.42 ha) surrounds the chateau. Many species have been planted.